Anyone would think a playground is a harmless place. But it is the most common place for injuries considering that children are energetic and carefree when on a playground. Children need all the physical and mental stimulation they get through play. Therefore, when providing natural play environments for children, safety is of paramount importance. Every year more than 20,000 cases of playground injuries are reported in the United States. There is no such data available for any of the developing countries, including India. However, according to a study on parental awareness of childhood injuries published in the Indian Journal of Pediatrics, the most common cause for injuries among children in India is – falls. The study further says that the maximum number of children vulnerable to injuries during play is between 5 and 14 years of age. Many of the injuries that occur during play are easily preventable. The playground can be checked for likely dangers that can cause accidents. Adult supervision is a pre-requisite for younger children who are unable to foresee hazards during play. Older children too are at risk when they try to show off to their friends or test their own limits while negotiating the bars of a jungle gym or other play equipment. Playground management is one of the many responsibilities of a PET (Physical Education Teacher). Playground management includes designing the playground, spacing the equipment, and maintenance and routine inspection. 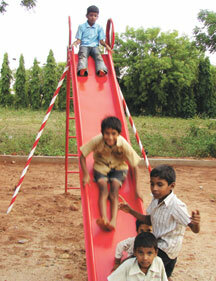 A typical school playground consists of courts, fields, tracks, and play equipment like slides, swings, jungle gyms, etc. Designing a playground effectively ensures that it engages the children in activities with minimum fuss and offers them maximum pleasure. 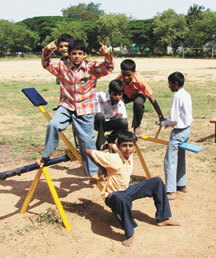 Ensuring age appropriate play spaces is an important aspect of playground management. Play areas for pre-school and older children should be separate. Since the equipment is likely to be different it follows that the play areas will be demarcated. 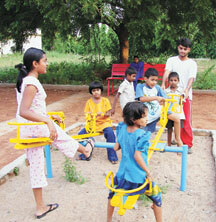 Children should also have opportunities for socialising while playing. Explaining the importance of safety to children and supervising them during play is one of the duties of the PET. Regular ground maintenance is a must. This includes rolling the ground and marking lines on courts and athletic tracks. Watering and rolling the ground makes the ground firm and prevents dust from rising when children play. Removing debris from the ground is important, hence it may need sweeping occasionally. Care of play equipment like bats, balls, hockey sticks, nets, etc., also come under the purview of the PET and due care needs to taken while storing these. Children themselves could be involved when a bat, racquet or a net needs to be repaired. The play surface has a crucial role in reducing injuries during play. Concrete and blacktop road surfaces are the hardest and unfit for children to play. Pediatricians say that a fall on to a hard concrete surface even from a height of one foot can cause a fatal head injury in a child. Plain ground is often good enough for children to play football, hockey or cricket on, but as it raises a lot of dust, it needs regular watering and rolling. Grass, on the other hand, is softer and reduces the impact of falls, but involves a cost factor and regular mowing. The play area must also be free of standing water. Play equipment must be inspected often for wear and tear and other potential hazards like loose ropes and loose links in chains. Check for any hooks that are likely to catch children’s clothing and cause a possible fall. Fall zones should be cushioned with appropriate material. No pushing and shoving on the jungle gyms or slides. No climbing from the guard rails, etc. During the games period there is likely to be a big group of children on the field, anywhere between 20 and 50 at least. To ensure that the games period passes peacefully the teacher has to make sure that the children use the entire play area and don’t huddle in a small part of it. Colourful carefully spaced marking that includes numbers, letters grids and various geometric shapes can be used to delineate play areas. Not only are they attractive, they also give the playground a cheerful look. This actually ensures that children do not injure themselves during play. Organised play areas can also reduce scope for bullying and other confrontations during play. Keep an eye out for tree roots, stumps and rocks. 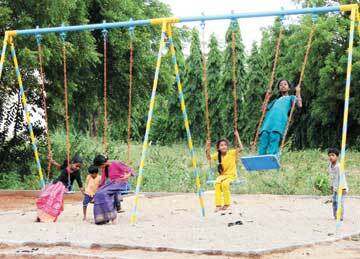 Heights of trees can be an issue if children play in the ground. Climbing trees is an experience all children cherish. Therefore, trees in the playground must be inspected for potential risks. Dead branches must be cut and removed. If the branches of the tree are far apart, it may be unsafe for children to climb the tree. Such trees should be cordoned off with a notice that says, ‘This tree is unsafe for climbing’. Check for roots, re-sprouting from stumps and the growing pattern of the tree. If the lower braches seem too weak, it may be wiser to prune them. Confrontations, even physical fights, on the playground are common as children are still learning to play by the rules. The PET is more often than not settling disputes among children. It would be a good investment of time if he could work out strategies for conflict resolution and brief the children in one class. Children should also be made aware of dares. Children, for instance, wouldn’t think twice before daring one another to jump off the topmost branch of a tree. They should be made aware of the danger involved in such foolish dares. For instance, as children during the 1972 Indo-Pak war, our favourite pastime was to climb trees. Due to the war, our play had a patriotic flavour and we would dare our friends to climb up the highest branch and urge them to jump. “Jump, jump, you can do anything for your country.” Luckily, we were duly chastised by an observant adult before anyone attempted the jump. Having said that, risk taking is a skill learnt easily on the playground, hence safe dares should be allowed. To prevent injuries to children, the PET could also guide them, perhaps teach them to jump the right way, and if they are old enough to understand, explain how leg muscles work and get injured. A PET could also draw a list of rules for play – no name calling, no pushing and shoving on the jungle gym, etc. It may also be helpful to give them simple advice on how to be a good sport – ‘Do not boast when you win and do not make excuses when you lose’. To make the class more aware of the importance of safety, one games period could be used to conduct a quiz, e.g. ‘How safety minded are you?’ Get children to make charts on topics like safety when climbing trees, safety when walking on the road, safety when swimming, safety for scouts and guides, first aid, being a good sport, etc. The PET could also assign a group of students to take turns at being ‘safety reps’ of their class, and train these children in basic first aid as well. 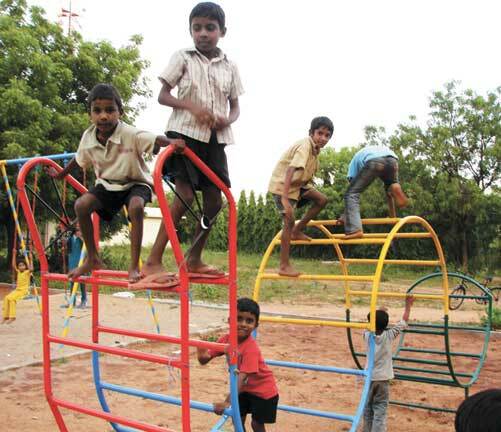 It is important to achieve the right balance in providing safe as well as stimulating and exploratory play areas. Children’s safety is a pre-requisite to play and no measure is too great to ensure their play is free of accidents. The author is a freelance writer based in Hyderabad. She can be reached at sujata117@yahoo.co.uk.